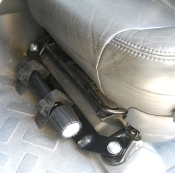 Moves your mirrors out 2.5" wider and 1.5" higher for increased visibility. Sold as a set. This is a billet aluminum mount adapter that will allow you to mount TWO, 4.5" Dia. 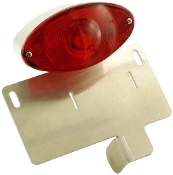 headlights, with 7/16" or 3/8" bottom stud mounts, on metric or standard bikes. Headlights sold separately. This is a billet aluminum mount adapter that will allow you to mount TWO, 4.5" Dia. headlights, with 7/16" or 3/8" bottom stud mounts, on Kawasaki Vulcan 900 and other metric bikes bikes. Headlights sold separately. 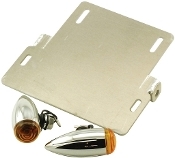 Allows you to mount a 7/16" or 3/8" bottom mount custom, Harley or chopper headlight (not included) on most metric bikes that came stock with a side mount headlight. 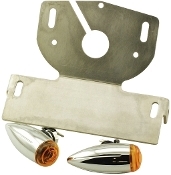 Allows you to mount a 7/16" or 3/8" bottom mount custom, Harley or chopper headlight (not included) on Kawasaki Vulcan 900 or any other metric bike that has mount holes from 3.89" to 4.48" wide, center to center. 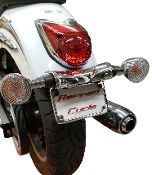 Replaces your stock lower fender with a slick, low profile License plate mount on Kawasaki Mean Streak 1500 and 1600. 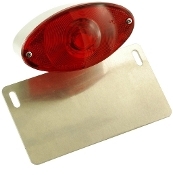 LPM10-License Plate Mount / Fender Elimination Yamaha V Star 950 replaces your stock plastic lower fender and plate mount with a slick, low profile plate mount that cleans up the look of your rear end. Replaces your stock lower fender with a slick, low profile License plate mount on Kawasaki Vulcan 900 VN900.